The present study aimed at investigating the oxidative stress in patients with Gestational diabetes mellitus (GDM) by estimating Haptoglobin. Blood samples were obtained from 46 GDM pregnant women and 32 controls that were attending the out patient department of M.Y.Hospital, Indore. The lipoprotein profiles, HbA1c and Haptoglobin were measured in all the samples. Significant increase in Haptoglobin as a risk factor for the development of GDM in our study subjects. Results of the present study indicate that increased Haptoglobin levels are indicators for the oxidative stress in GDM women who had body mass index ≥26 Kg/m2 as compared to controls. The importance of oxidative stress and reactive oxygen species (ROS) in the cardiovascular diseases in humans and animals has been well-described . Hemoglobin (Hb) is an important mediator of oxidative tissue damage (OTD) that is released from red blood cells at sites of vascular injury. Haptoglobin (Hp) is serum protein that serves as an antioxidant by virtue of its ability to bind to Hb and prevent hemoglobin-mediated OTD . After hemolysis, Hp – Hb complexes are formed, which are rapidly eliminated by hepatocytes and by macrophages . Rapid complexation of free Hb with Hp is important be-cause free Hb catalyses the generation of ROS and in turns promote endothelial dysfunction and which is also observed in gestational diabetes mellitus (GDM) . GDM is defined as glucose intolerance that is first detected during pregnancy . Which is most common complicated problem in pregnancy and carries considerable risk for both the fetus and the mother. Obesity is the most prominent risk factor for GDM patients and is linked to inflammatory processes and increasing the cardiovascular risk . The present study aimed at investigating the association between Hp levels in pregnant womens who suffering from GDM. Our study was performed in 46 consecutive, pregnant women and 32 controls who were visited to the out patient Department of Obstetrics and Gynecology, M.Y. Hospital, Indore, for screening for GDM between the 24th and 28th gestational weeks by oral glucose tolerance test (OGTT), with a Body Mass Index (BMI) ≥ 26 kg/m2, age ≥ 34 years. All patients gave fully informed consent and the study was approved by the ethical and research committee of M.G. M. Medical College. Fasting venous blood was collected from all subjects between 9-11am. The lipoprotein profile parameters were determined by using Nicholas piramal LTD manufactured reagents. Hp was assayed by immunoturbidimetric method by using Roche Diagnostics . OGTT was performed as described in previous study . Statistical analysis of the data obtained was performed by using the Man-Whitney test. Results of the present investigation are shown in Table 1 and 2. 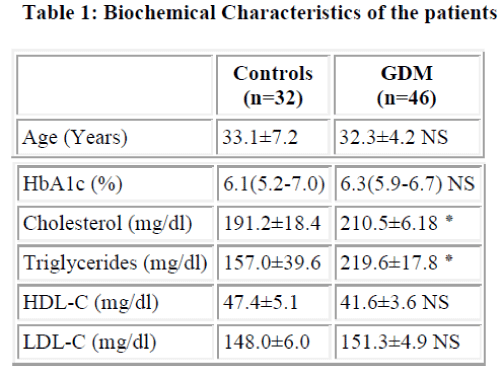 A significant increase in cholesterol levels (p=<0.05) is observed in GDM patients (Table 1). Like wise triglycerides were also increased significantly (p=<0.05). But the high-density lipoprotein cholesterol (HDL-C) levels were slightly decreases in GDM patients compared to controls and they are statistically not significant. The Hp levels were also increased significantly (p=<0.05) in GDM patients when compared to controls. On the other hand, BMI levels were slightly increases in GDM patients but they are not statistically significant (Table 2). This observation is an evidence for the role of oxidative stress in GDM patients. Increased cholesterol, triglycerides and Hp levels were significantly associated with the occurrence of GDM in our study population. Similar observations are noticed in Mustafa et al . The possible sources of oxidative stress in GDM patients are non enzymatic glycosylation, glucose auto-oxidation, concentration of inflammatory me-diators and antioxidant status. Anastasiou et al  and Mittermayer F et al  have reported that obesity is the most prominent risk factor for GDM and type 2 diabetes in prior GDM and is linked to increasing the cardiovascular risk. Orhan H et al  have reported Hp contributes to the development of hyperglycemia at times of increased endothelial oxidative stress, such as GDM. Hp influenced the occurrence of GDM only in the presence of an elevated BMI due to cor-relates positively with oxidative stress . The results obtained support the earlier studies [2,13]. Several functions have been assigned to the Hp that may impact on development of CVD. It has been appreciated for over 60 years that a major function of serum Hp is to bind free Hb . This interaction is thought to help scavange iron, and prevent its loss in the urine, and serve as an antioxidant, thereby protecting tissues against Hb-mediated tissue oxidation. Such a hypothesis is particularly intriguing given the apparent important role of oxidative stress in the development of diabetic vascular complications . The main limitation of this study is its relatively small size especially in the diabetic pregnant women and it may be concluded that Hp is a risk factor for the development of GDM in our study population. This was independent of age, BMI and lipid profile. Further studies in other populations including large number of subjects may fetch a more conclusive result. Schneider JE, Berk BC, Gravanis MB, Santoian FC, Cipolla GD et al. Probucol decreases neointimal formation in a swine model of coronary artery balloon injury: a possible role for antioxidant in restenosis. Circulation 1993; 88: 628-637. Gutteridge JM. The antioxidant activity of haptoglobin towards hemoglobin- stimulated lipid peroxidation. Biochem Biophys Acta 1987; 917: 219-223. Kino J, Tsunoo H, Higa Y, Takami M. Hemoglobin-haptoglobin receptor in rat plasma membrane. J Biol Chem 1980; 255: 9616-9620. Anastasiou E, Lekakis JP, Alevizaki M, Papamichael CM, Megas J et al. Impaired endothelium dependent vasodilation in women with previous gestational diabetes. Diabetes Care 1998; 21: 2111-2115. Metzger BE, Coustan DM, Organizing committee. Summary and recommendations of the fourth international workshop-conference on gestational diabetes mellitus. Diabetes Care 1998; 21: suppl 2: B161-B167. Kautzky-willer A, Fasching P, Jilma B, Waldhausl W, Wagner OF : Persistent elevation and metabolic dependence of circulating E-selection after delivery in women with gestational diabetes mellitus. J Clin Endo-crinol Metab 1997; 82: 4117-4121. Viedma JA, de la Iglesia A, Naverro A. Imuunoturbidometry of haptoglobin and transferrin in the EPOS 5060 analyzer. Clin Chem 1987; 33: 1257. Stefon Mustafa, Thomas Vukovich, Thomas Prikoszo-vich, Christine Winzer,Barbara Schneider et al. Haptoglobin phenotype and gestational diabetes. Diabetes Care 2004; 27: 2103-2107. Anastasiou E, Lekakis JP, Nevizaki M et al. Impaired endothelium-dependent vasodilatation in women with previous gestational diabetes. Diabetes Care 1998; 21: 2111-2115. Mittermayer F, Meyer BX, Meyer A, Winzer C, Pacini G et al. Circulating concentrations of asymmetrical dimethyl-L-arginine are increased in women with pre-vious GDM. Diabetelogia 2002; 45: 1372-1378. Orhan H, Onderoglu L, Yucel A, Sahin G. Circulating biomarkers of oxidative stress in complicated pregnancies. Arch Gynecol Obstet 2003; 267: 189-195. Keaney JF, Larson MG, Vasan RS, Wilson PWF, Lipinska I et al. Obesity and systemic oxidative stress in the Framingham study. Arterioscler Thromb Vasc Biol 2003; 23: 434-439. Miller YI, Altamentova SM, Shaklai N. Oxidation of LDL by hemoglobin stems from a hemeiniated globin radical: antioxidant role of haptoglobin. Biochemistry 1997; 36: 12189-12198. Andrew P levy, Irit Hochberg, Kathleen Jablonski, Helaine E, Resnick et al.Haptoglobin phenotype is an independent risk factor for cardiovascular disease in in-dividuals with diabetes: The Strong Heart Study. J Am Coll Cardiol 2002; 40: 1984-1990. Guigliano D, Ceriello A, Paolisso G. Oxidative stress and diabetic vascular complications. Diabetes Care 1996; 19: 257-267.